Lens hood for Canon 50mm f1.8 STM version. Reversible onto lens for safe storage. 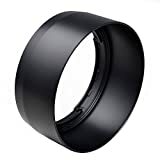 Lens Hood for Canon 50mm f1.8 STM lens. Similar to originla lens. This entry was posted in Discount Photography and tagged Canon, ES68, Hood, lens, Maxsimafoto by Ball Photo. Bookmark the permalink.